Trying to find ways to improve your child’s’ reading and writing abilities while also enjoying the summer sun? This article has some great activities to share! Everybody knows that the summer break is a great opportunity for students to get out and enjoy the summer sun. However, it’s also the perfect time to bolster their learning or to address any learning challenges faced throughout the year. But, what if you could fit them both into a fun day out? Improve Reading and Writing Skills With a Picnic! 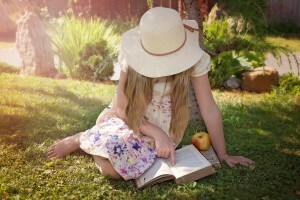 Below is a great post from The Tutoring Center, Santa Clara with some activity ideas which can see your youngster enjoying the summer sun while also sneaking in a bit of learning time and creating a positive connection with reading and writing. The first place you will start is in your kitchen preparing everything you will all need for a successful and fun day out at your local park or favorite picnic area. Of course, don’t forget to pack a few delicious snacks, too! Once you have everything you need, include a couple of pads of paper, some pens, and a few colored pencils and head to the park! After you have all had a chance to enjoy the play equipment, take a rest under a tree or in some shade and get to writing. However, instead of instructing your youngster on what to write as their teacher would, tell them to write about absolutely anything they want. Encourage them to write about anything, whether it’s a simple diary entry about what they have done during that very day or writing a story made up of fictitious characters they have seen on television or even created themselves. If you want to make it a group activity, start by writing one or two paragraphs, then hand the pad of paper to your youngster to write a couple more, then take it back and write another two, and so on. Will this result in a story which makes little to no sense? Yes! Will it also result in your student enjoying the act of writing and actually laughing while they practice their writing skills? Absolutely, yes! It also affords you the perfect opportunity to identify if your student is struggling with their writing skills, including areas like spelling or sentence structure. These are important issues which you can address with some homework help or a bit of summer tutoring. If your student struggles with their spelling or has trouble putting sentences together, one-to-one summer tutoring can help. Speak with a learning professional at The Tutoring Center, Santa Clara today by calling (408) 816-7825 to book your free initial diagnostic assessment and to learn more about how subject focused one-to-one tutoring programs can help your student improve their writing skills and their self-esteem. What happened in the last chapter? What do you each think will happen in the next chapter? What do you think will happen at the end of the book? If you like, you can use the small treats you packed as rewards for the person who correctly guesses what happens in the next chapter! Similar to the writing task, this activity also affords you a great opportunity to identify any learning challenges your youngster is experiencing, such as struggling to pronounce common words or even trouble understanding context. Whether it’s reading or writing, one-to-one summer tutoring can help! Speak with a tutoring professional today at The Tutoring Center, Santa Clara by calling (408) 816-7825 and book your free initial diagnostic assessment. During your first visit, a tutoring expert can explain the benefits to subject-focused tutoring programs and answer any questions you have about the benefits of one-to-one tutoring.